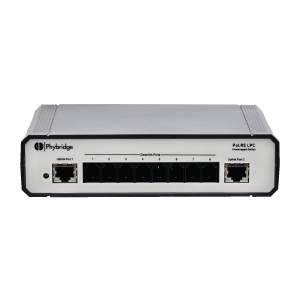 The plug and play PoLRE (Power over Long Reach Ethernet) LPC switch is an 8 port unmanaged ethernet switch. This powerful switch delivers ethernet and PoE over a single pair of wire with 1,200 ft (365 m) reach. 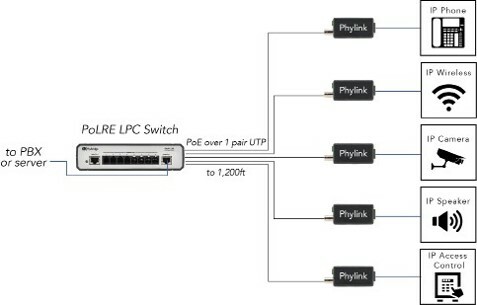 The LPC delivers 10 Mbps (symmetrical, full duplex) and PoE over a single pair of UTP with 1,200 ft (365 m) reach. It is designed to support IP Phones and other IEEE compliant devices. There is no reduction in bandwidth speed based on longer distances. PoLRE LPC was designed to make it simple for small businesses or distributed enterprise to simplify their IP modernization. No network configuration required. External Power Supply External 100w power supply included. Optional higher power supplies available. Interface (PoLRE Switch Side) 1 RJ11 port: CAT3 unshielded single twisted pair cable. Between the wall plate and adapter, you can reuse the existing line cord when doing a DNIC/ POTS displacement. • Can support 16-24-gauge range of cable. NV-PL-PA011-6 The Phylink adapters are sold in packages of 6 and are media converters for the PoLRE switch family. They convert a two wire RJ11 connections into a RJ45 connection for standard Ethernet cable. NV-PS55-165W 55VDC 3A (165 Watts), power supply for PL-08 switch, if additional power is required.